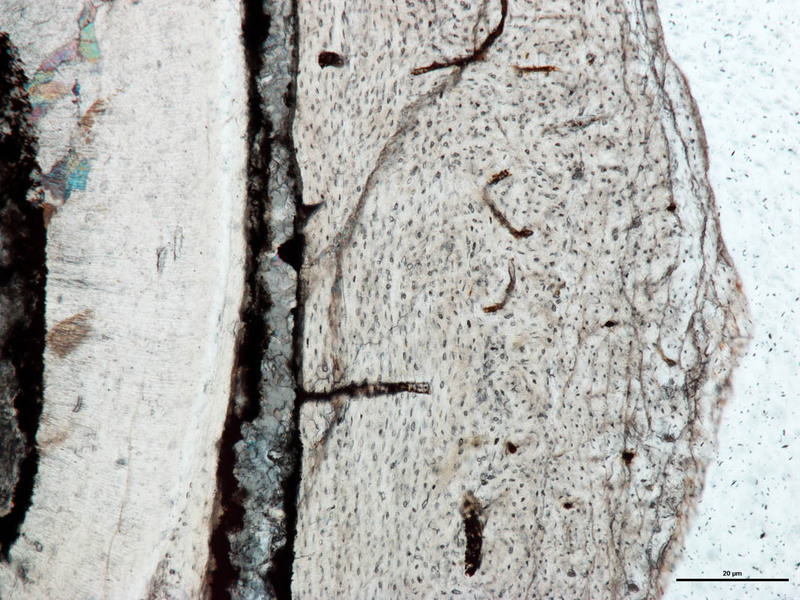 Palaeohistology is the study of fossilized tissues. When most people think of tissues, they tend to think of muscle, tendon, skin, or other soft tissues, but bones and teeth also fit the bill, because they are made of mineralized (and non-mineralized) tissues. Because of their high mineral content, bones and teeth tend to preserve quite nicely in the fossil record and so the vast majority of our knowledge in vertebrate palaeontology comes from studies of the hard parts. What many people don’t realize is that the process of fossilization can preserve a lot of the original details of bones and teeth. Palaeontologists can visualize these tiny details by making thin slices of fossil bones and teeth, called thin sections. Closeup of a tooth (left) and jaw bone (right) of a fossil mammal. All of the tiny dots in the bone are spaces left behind by the bone cells that used to be found all over the bone. The larger worm-like gaps in the bone are the spaces left behind by blood vessels.